An uptick in California sea lion activity this week set the stage for Oregon and Washington wildlife managers to corral nine of the big marine mammals in floating traps below the Columbia River's Bonneville Dam Tuesday. The trapping effort, conducted on and off since 2008 during the springtime, has a primary focus of removing sea lions that have been known in the past to feed on salmon and steelhead that mill a bit before finding the dam's fish ladders. 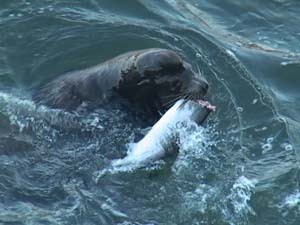 It aims to reduce sea lion predation on salmon, especially wild stocks that are listed under the Endangered Species Act. Six of the California sea lions trapped Tuesday were not known to researchers and thus were branded for future identification and released. Researchers have since 2002 monitored sea lion activity below the dam in winter and spring to assess impacts on listed fish. During that process they have catalogued identifiable pinnipeds that have been observed feeding on salmon, and thus become eligible for removal upon their return. Three of the California sea lions trapped Tuesday satisfied criteria that made them eligible for removal. Two of the three will soon take up residency at Queens Zoo in New York. The third was euthanized. So far this year four California sea lions have been trapped at the dam and removed, including two that were euthanized via lethal injection. The authority to remove California sea lions was granted to the states by NOAA Fisheries under Section 120 of the Marine Mammal Protection Act. From March 2008 when authorization was first granted through 2012 a total of 54 California sea lions have been removed. Eleven were sent to zoos and aquaria and the others met fatal ends. ODFW is working with a scientist from National Geographic to test a new remote release system for the organization's "critter cams." Two steller sea lions have been fitted with video cameras using the remote release system. This will allow scientists to recover the cameras and view the footage. With more upriver spring chinook salmon approaching Bonneville's fish ladders, California and Steller sea lions are picking up their activity and eating habits. "The last two and a half weeks it's gone crazy," said Robert Stansell, who heads the U.S. Army Corps of Engineers' sea lion research group at the dam. The Corps owns and operates Bonneville. "That's what happens every year. . . when the fish are here the sea lions are here," Stansell said. Salmon counts at the dam had been lagging, totaling just a few hundred per day until last week when they climbed over 1,000. The peak count so far this year has been 5,346 on April 26. Still, California sea lion numbers at the dam this year are lower than the researchers have ever observed, based on the average number seen at the dam daily over the course of the late winter-early spring. ". . . however many new individuals showed up this past week," according to the weekly status report on the Corps research. "The maximum number of CSL seen on any one day so far this year is 18. We've identified about 45 so far, at least 11 being repeat individuals from previous years. "Steller sea lions (Eumetopias jubatus - SSL) numbers are slightly higher than past two years at this point . . . . The maximum number of SSL seen on any one day so far this year was 40 . . . . We have documented approximately 77 different SSL's visiting the dam so far (including 32 with brands). All but 29 SSL are confirmed as seen in past years, although these figures are preliminary." "Predation by SSL (primarily) and CSL on salmonids has increased dramatically this past week and is now higher than last year at this point and higher than 2002 and 2005 estimates," the May 2 report says. "Total salmonid catch through May 1 (1,374 expanded by interpolating for weekends) almost doubled the total since last week. "Sturgeon catch (482 expanded by interpolating for weekends only) is the lowest rate since 2007 at this time of year, most being taken in the 2 to 4 foot range. CSL consumed more salmonids this past week than SSL, However SSL's continue to have the higher prey total consumed for the year, including salmonids." A total of 31,217 adult spring chinook had been counted through Wednesday this year passing over the dam's fish ladders. More than 25,000 of those fish were counted since April 24. That count remains as the fourth lowest in the past 11 years, but is on par with all but three totals through May 1 during that period. Totals through May 1 were 141,728, 108,058 and 141,677 in 2010, 2004 and 2003 respectively. But otherwise the May 1 totals have been 50,000 or fewer. Upriver spring chinook counts at season's end have ranged from a low of 67,500 in 2007 to a high of 244,400 in 2010.